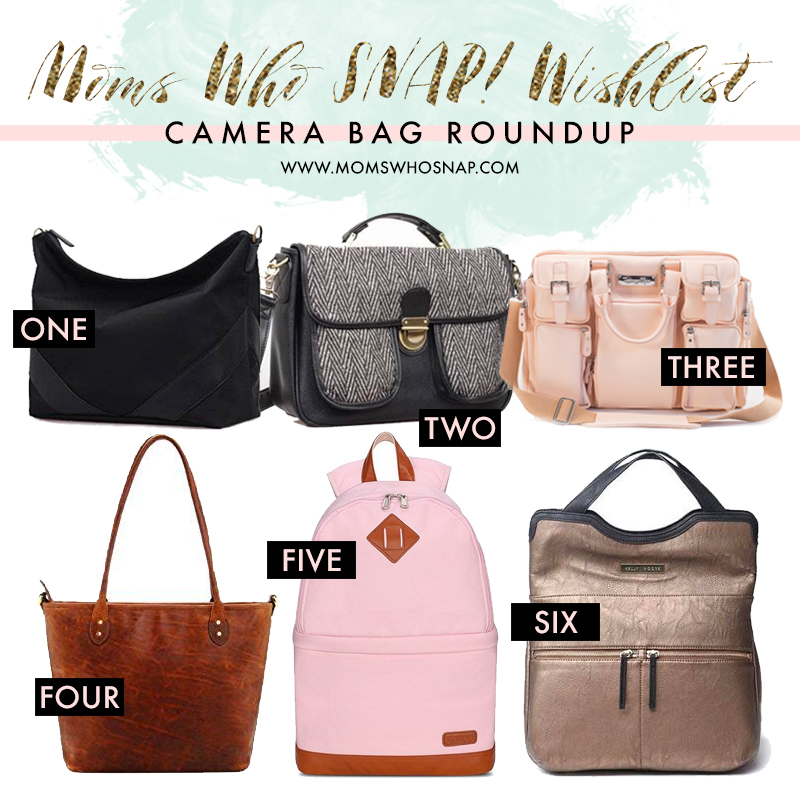 holiday wishlists for the camera-lover in your life! 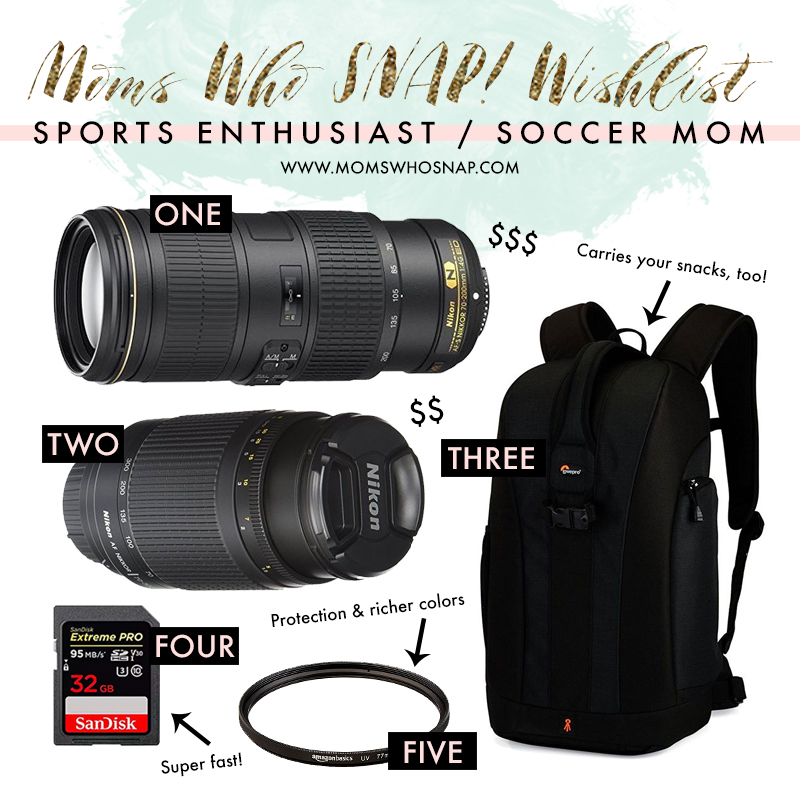 Some of the most popular topics in our Moms Who Snap Facebook group are about which lens is best for what, which camera to to buy, and what software/courses are recommended. (Psssst.....if you're not a part of the group, come join us!) 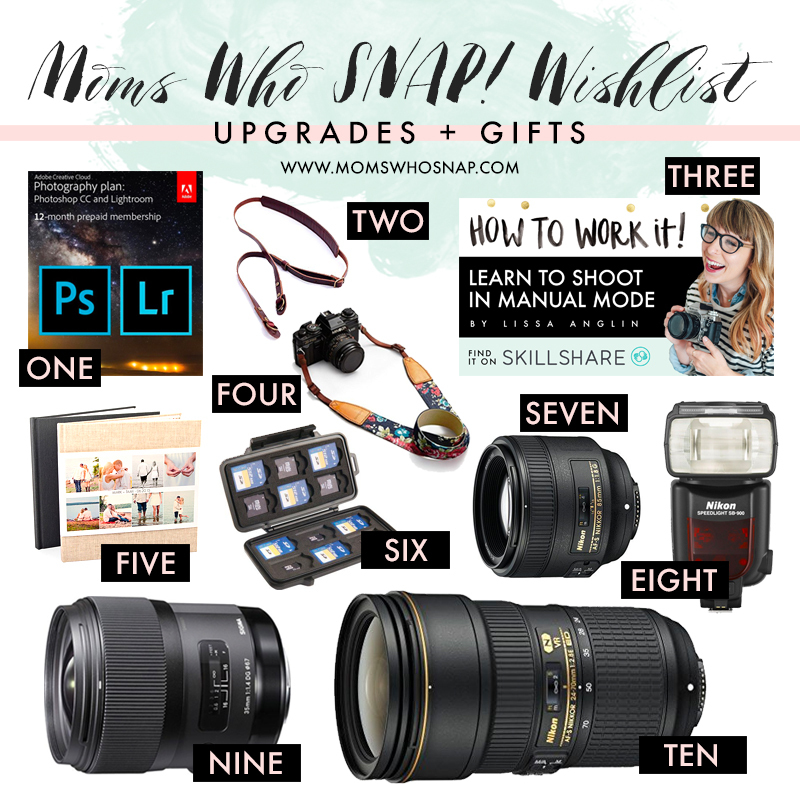 I love hearing what works for everyone, but I thought it would be fun to compile some all-inclusive "must haves" for beginning photographers, soccer moms, and even those who have been shooting a while. So, I've created 4 wishlists, just in time for Christmas shopping! 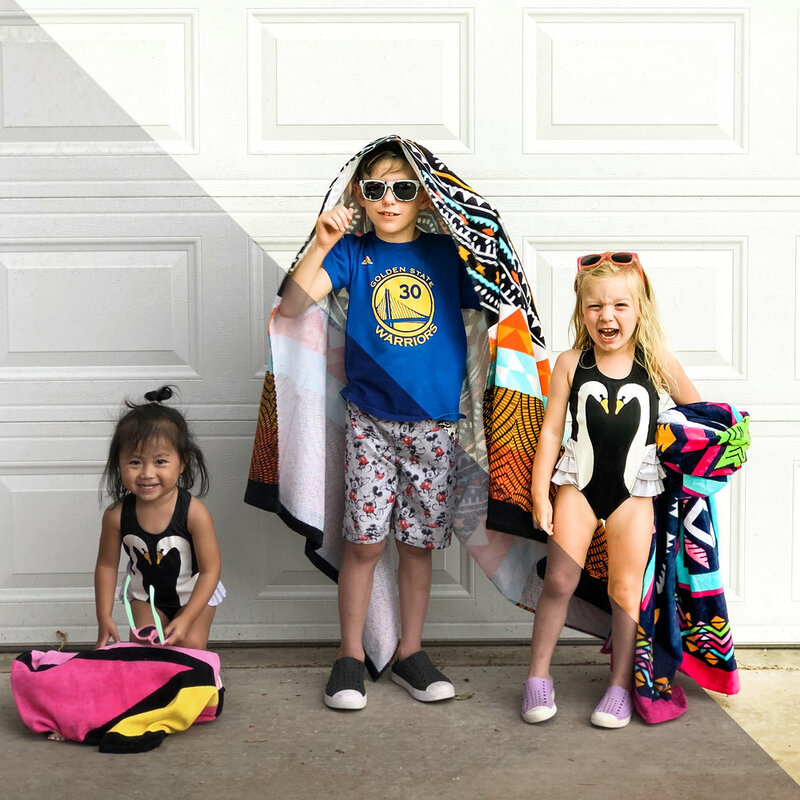 It was SO much fun to put these together, and I'm hoping they will be helpful if you are buying for a momtographer or if you need something to easily pass to that family member who has no idea what to buy you! I'm linking all the products and sharing a little about why they've made my list this year under each photo. Enjoy! I'm asked all the time to give a recommendation on a "nice camera"- this is it, friends! I always trust what Ken Rockwell has to say, and the D3400 is his favorite DSLR for the price. It comes with an 18-55mm lens (also known as a "kit" lens), that will perform well outside, but also including the 50mm prime lens makes this setup a great all-around choice. Add in an extra battery, a super fast SD card and cute bag, and you are good to go! I've shot Nikon all my career, so that's what I know best, but I'll also be linking the Canon equivalents in case you'd prefer to go Canon- both companies are equally great! I've linked the refurbished model- a great way to save some cash! This camera also has Eye-Fi technology which means you can connect it to your computer or phone and get images sent straight to them! 32GB will hold quite a few images- at least 400 RAW files, or over 4000 JPG! And it's quick writing speed means you'll be able to shoot more quickly too- highly important when you're trying to capture a busy toddler! This is a cute bag at a great price point. The camera compartment is removable, and there is plenty of other space to store your stuff. Wooo- this was a fun one, and I had WAY too many bags to fit into this graphic! So here are the ones I've had my eyes on! ONE- JoTotes Hanover Bag This is my day-to-day workhorse of a bag. I love it! TWO- JoTotes Georgia Herringbone Bag Cute for work and travel! THREE- House of Flynn Evermore Bag This bag comes in a ton of different colors and fabrics! FOUR- Ona The Capri Shoulder BagCalling all leather lovers! FIVE- Kattee Camera Backpack Comes in navy and black as well! SIX- Kelly Moore Steph Bag Helllloooo, metallic! I also love the shape. I have owned several Kelly Moore bags and loved every one! Another popular question I get is "what lens do I need to photograph my kids' sports games"? I'm afraid the answer isn't cheap, but it will do the trick and me a worthy investment! Here's the perfect setup for all you soccer moms! This is the older model, (you can buy the newer one at almost $2000 more! ), but I have had this exact lens for 11 years and it continues to be one of the most tried-and-true lenses- able to reach long distances in low light. THREE- Lowepro Flipside Backpack I loved the look of this backpack AND the fact that you can fit the 70-200 lens in it easily, along with the rest of your gear. Not only will this help protect your lens, it will help reduce UV light and create richer colors. This is a pre-paid 1 year subscription. Lightroom the THE most essential software needed to organize and edit your images, and Photoshop is it's even cooler older brother. Because the yellow and black ones are just ugly. Yes, this is MY course- but- I have to say that it has gotten rave reviews on Skillshare! This would be an easy gift for someone wanting to learn how to really work their DSLR camera- and it's all done at their own pace. My suggestion would be to get at one-year membership to Skillshare (around 100.00). Not only will that grant you access to all my How To Work It classes, but my editing course as well- not to mention the thousands of other great classes on Skillshare! This is the place I recommend to my clients for photo goods and printing. mPix is the consumer side of one of the best professional labs, and I've been consistently impressed with their products! These cases are tough and I love knowing my cards are in a safe place where they don't have a chance to fall out. This baby makes some beautiful portraits and performs well in low light. A great addition to a basic lens collection. This flash will drastically improve the look and quality of your images when you need to use flash. Instead of blinding your subjects with the on-camera flash, this one can be used to bounce light off another surface, creating a more natural, even look. This is on my actual wishlist this Christmas. It is an amazing workhorse of a lens that covers a wide range of focal lengths, allowing you to get wider shots or portraits. Plus, the 2.8 means it performs well in low light! Whew, that was a lot of info! Hope you find this helpful! As always, I am happy to answer questions (i.e. offer my opinion!) about anything you see here. This post is not sponsored in any way and is alllll my professional opinion. 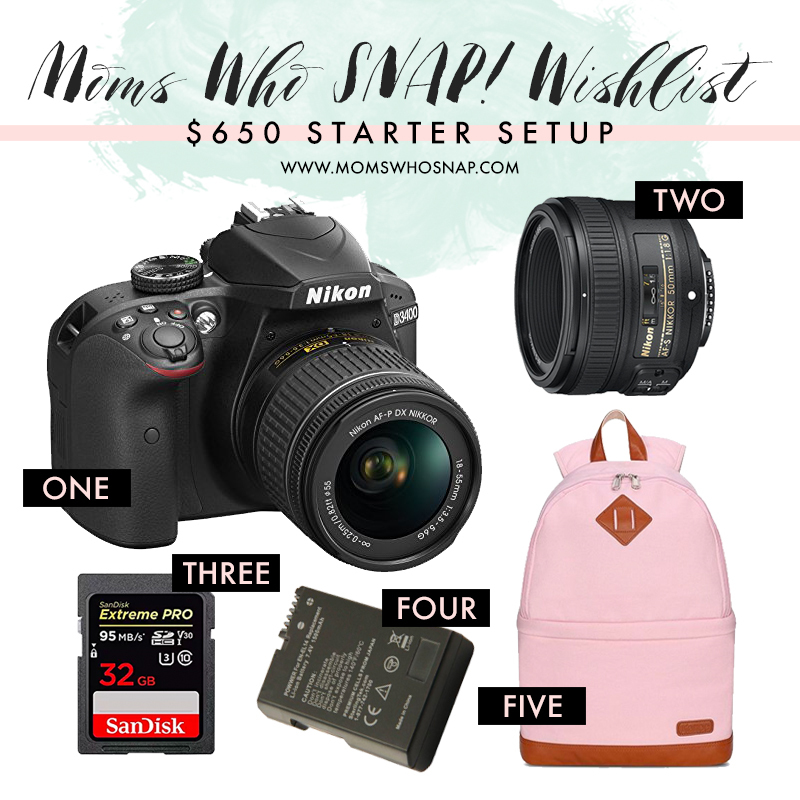 It does contain affiliate links that help me pay for the childcare I need to put these wishlists together for you- haha. But seriously, it's true. Can anyone get anything done with a very "helpful" two year old around?! ?